J/22 Worlds 2018 Welcome to Annapolis! Annapolis Yacht Club (AYC) welcomes competitors to the 2018 J/22 World Championships, which will be contested off Annapolis September 9-14. Happy 5th ALDR! 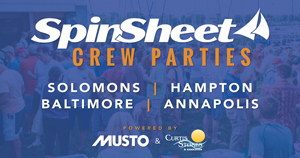 A joint effort between the Annapolis and Eastport Yacht Clubs, the regatta will be run for its fifth year September 1-2. The 10th and final Sippy Cup was raced August 4, from Rock Hall to North East, MD, despite heavy thunderstorms in the area and the threat of debris in the water. Oxford 2018, Cape Charles, and more—racing sailors competed in a few Bay favorites over the weekend of August 10-12.